Released in August 2009, this triple fermented cigar features a wide variety of ligero tobaccos from several regions of South America. Sam Leccia, mastermind behind the popular NUb Cigar, created the Cain Daytona Cigar with the sole intention of creating a full bodied smoke that is smooth, but with a catch that it must derive solely from ligero. 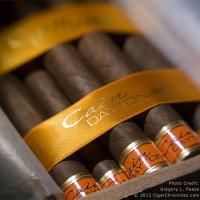 With the Cain Daytona being named as one of the "Best Bargain Cigars of 2011" by Cigar Aficionado, this is a can't miss cigar.